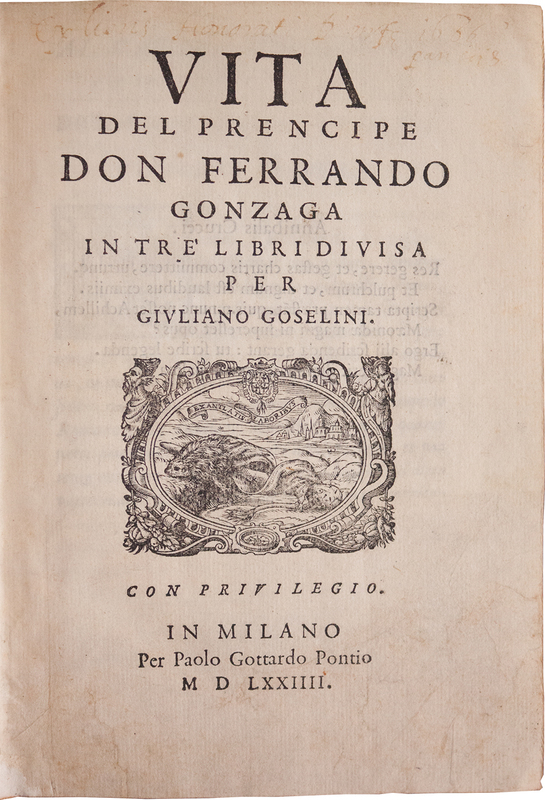 Front cover of Vita del Prencipe Don Ferrando Gonzaga. 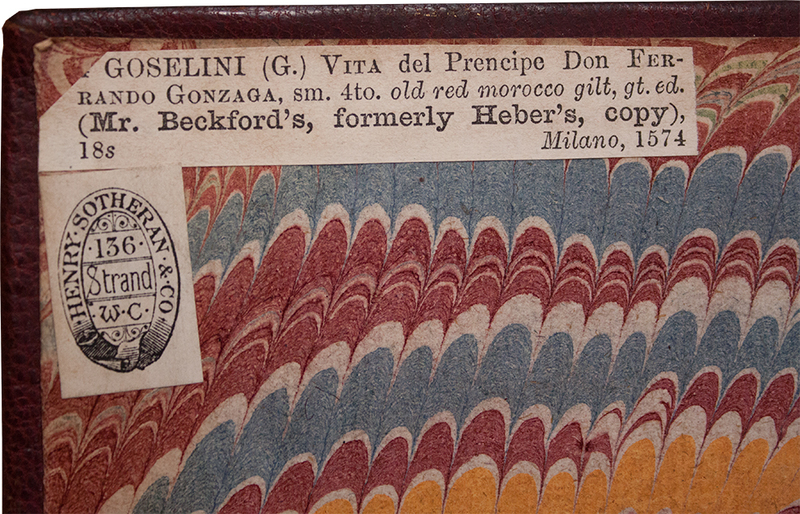 This copy of the Vita del Prencipe has a red, morocco leather binding. A double fillet border is gold-tooled on both covers. The spine has five raised bands; it is divided into six compartments. The title is gold-tooled in the second compartment from the head. Each of the other compartments repeat a gold-tooled floral pattern. The board edges are gold-tooled as well. 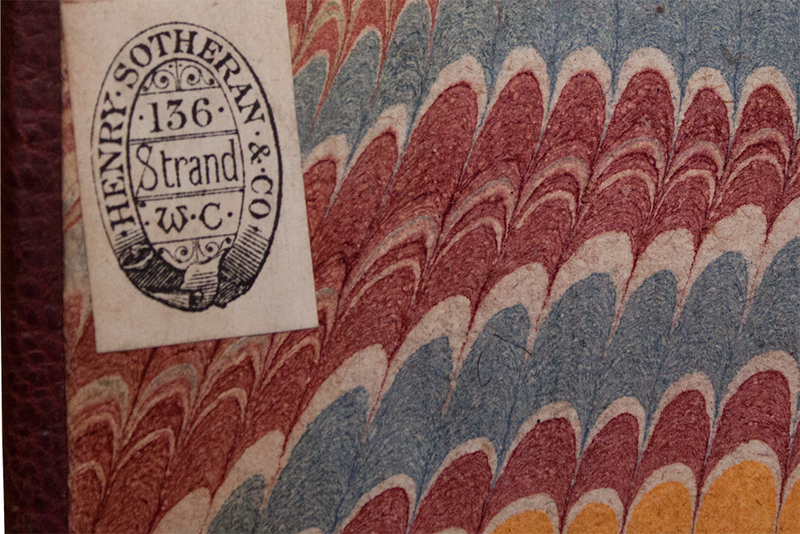 The endpapers are wide-comb marbled. The laid paper has horizontal chain lines and vertical wire lines. 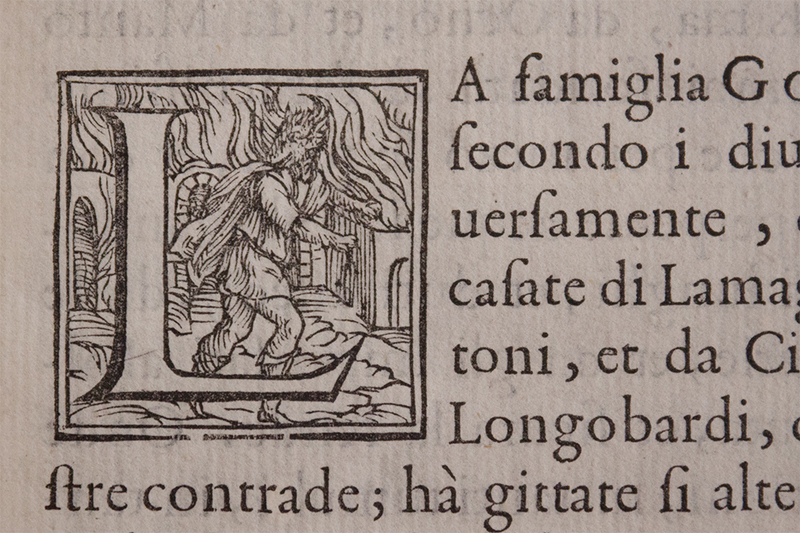 This copy has a colophon date of 1575. There are scratches and soiling on both covers. The corners and edges are rubbed. Both joints show cracking and closed tears near the head and tail. There are open tears on the head and tail of spine. The head of the textblock and the headband are soiled. Gold is missing from the double fillet border and the "o" of Gonzaga on the spine. A small scratch on the foreedge affects pages 353-416. Foxing and tanning on the margins appears throughout the text. Possible dampstains in the bottom margin start around signature Oo and worsen towards LLl. Having had many prominent owners, the text is, disappointingly, clean. This book has passed through its owners' hands as a luxury item. It was owned by aristocratic authors, scholars, and collectors. Its hand-tooled, expensive morocco binding, gilt edges, and historiated initials provide excellent examples of the tastes and techniques involved in sixteenth-century book production. In the sixteenth and seventeenth centuries, Milan was under Spanish control.7 Ferrante Gonzaga's loyalty to Spain and his position of power and influence in Milan make him a representative figure for this period in the city's history.8 No English translation of this book exists. There are no similar biographical monographs on Gonzaga. The record Goselini made, therefore, stands as an important resource for any future scholarship on an important leader of this period. The first known owner of this book, Honoré d'Urfé, was a French author who lived from 1568 to 1625. He is mainly known for L'Astrée, his most influential work and his only novel, the first part of which was published in 1607. D'Urfé explored varied philosophical, historical, and political themes in this monumental opus, which was ultimately left uncompleted at the time of his death. Honoré d'Urfé's inscription on title page with an inverted, high-contrast copy. 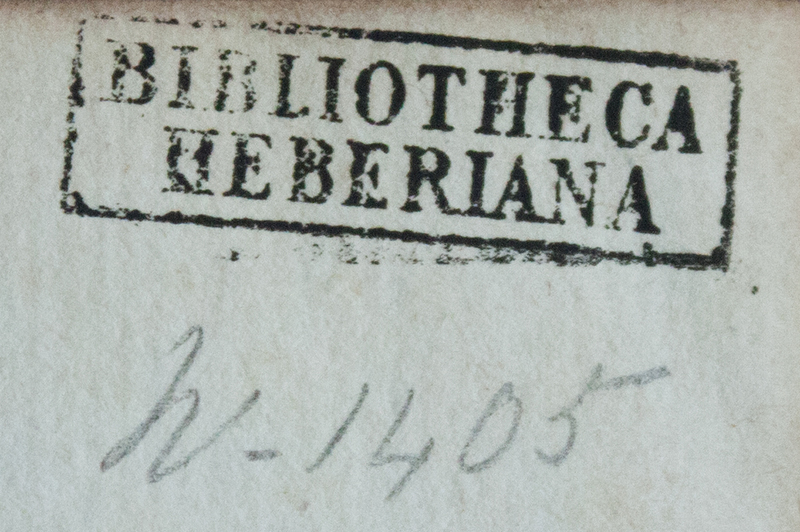 "Bibliotheca Heberiana" ink stamp from front flyleaf recto. Clipping of catalogue entry from Sotheran's Price Current of Literature identifying previous owners as Mr. Beckford and Heber. "Henry Sotheran & Co." bookseller's ticket. A handwritten note on the front free endpaper verso locates the Vita del Prencipe at this same auction: "From Sale of Battle Abbey Library at Sotheby's 16 June 1902." A Battle Abbey book label on the front pastedown further verifies it as being part of the duke's library. "Battle Abbey 208" book label. "From Sale of Battle Abbey Library at Sotheby's 16 June 1902" handwritten in ink on front free endpaper verso. "Henry J. 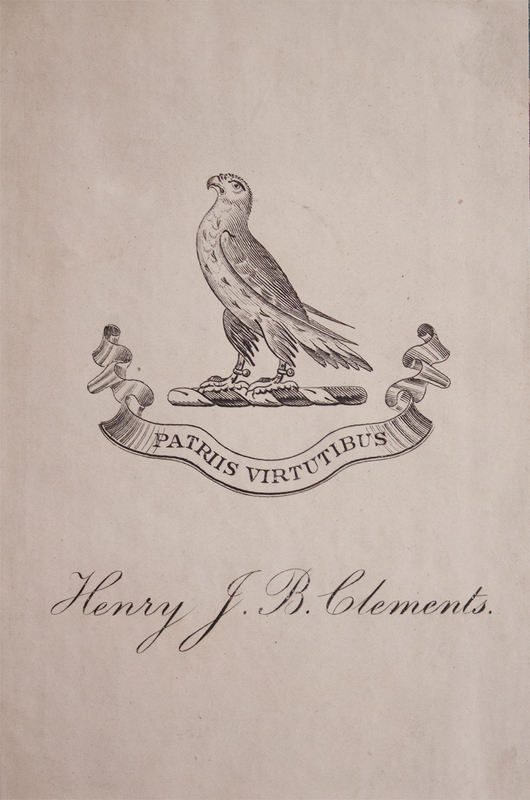 B. Clements" bookplate on fron free endpaper recto. 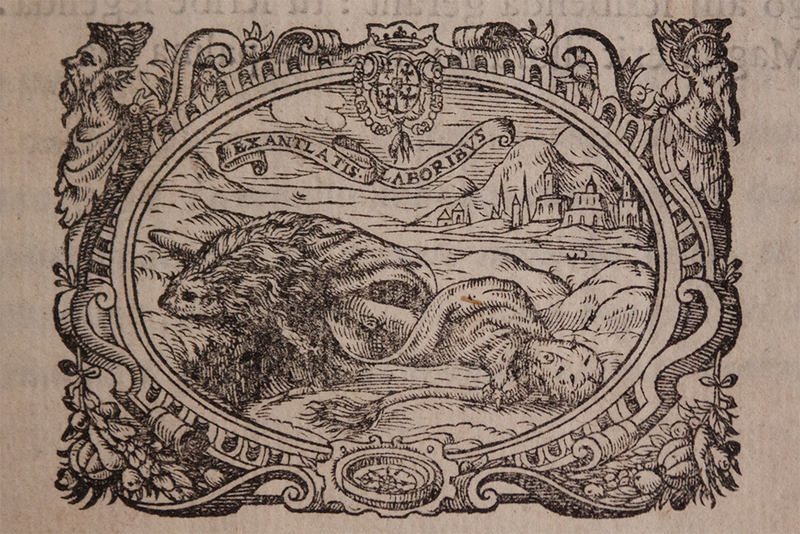 His name and motto, "Patriis Virtutibus," appear on this non-armorial bookplate. 1 Stefano D’Amico, Spanish Milan: A City within the Empire, 1535-1706, Book, Whole (New York: Palgrave Macmillan, 2012), 130. 2 Richard Wistreich, Warrior, Courtier, Singer: Giulio Cesare Brancaccio and the Performance of Identity in the Late Renaissance (Ashgate Publishing, Ltd., 2013), 21. 3 Eric W. Cochrane, Italy 1530-1630, ed. Julius Kirshner, Longman History of Italy (London: Longman, 1988), 36. 4 D’Amico, Spanish Milan: A City within the Empire, 1535-1706, 130. 5 G. Garollo, Dizionario Biografico Universale, vol. 1 (Milan: Ulrico Hoepli, 1907), https://hdl.handle.net/2027/uc1.$b471189, 958. 6 British Library, Short-Title Catalogue of Books Printed in Italy and of Italian Books Printed in Other Countries from 1465 to 1600 Now in the British Library (London: The British Library, 1986), 918. 7 D’Amico, Spanish Milan: A City within the Empire, 1535-1706. 9 British Library, Short-Title Catalogue of Books Printed in Italy and of Italian Books Printed in Other Countries from 1465 to 1600 Now in the British Library, 309, 918. 10 British Library, Short-Title Catalogue of Books Printed in Italy and of Italian Books Printed in Other Countries from 1465 to 1600 Now in the British Library: Supplement (London: The British Library, 1986), 110. 11 Jean-Pierre van Elslande, “Honore D’urfe,” Dictionary of Literary Biography (Detroit: Gale, 2003), http://go.galegroup.com/ps/i.do?p=LitRC&sw=w&u=msu_main&v=2.1&it=r&id=GALE%7CH1200011019&sid=summon&asid=7c102e8f3e1a035e362172573a7c75ef. 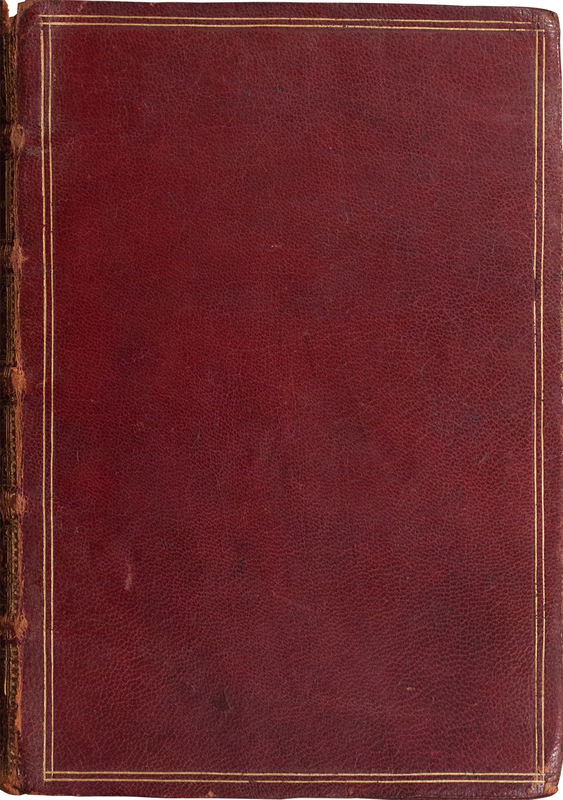 12 Marc Vaulbert de Chantilly, “Property of a Distinguished Poisoner: Thomas Griffiths Wainewright and the Griffiths Family Library,” in Under the Hammer: Book Auctions since the Seventeenth Century, ed. Robin Myers, Michael Harris, and Giles Mandelbrote (New Castle: Oak Knoll Press, 2001), 129. 13 Arnold Hunt, “The Sale of Richard Heber’s Library,” in Under the Hammer: Book Auctions since the Seventeenth Century, ed. Robin Myers, Michael Harris, and Giles Mandelbrote (New Castle: Oak Knoll Press, 2001), 146. 16 S. Sotheby & Son, Bibliotheca Heberiana. Catalogue of the Library of the Late Richard Heber, Esq. (London: S. Sotheby & Son, 1834), http://hdl.handle.net/2027/nyp.33433089894954, 162. 17 Hunt, “The Sale of Richard Heber’s Library,” 144. 18 Devendra P. Varma, “William Beckford,” in Supernatural Fiction Writers: Fantasy and Horror, ed. Everett Franklin Bleiler, vol. 1, Scribner Writers Series (New York: Charles Scribner’s Sons, 1985), http://ezproxy.msu.edu.proxy1.cl.msu.edu/login?url=http://go.galegroup.com.proxy1.cl.msu.edu/ps/i.do?p=LitRC&sw=w&u=msu_main&v=2.1&it=r&id=GALE%7CH1479000064&asid=270aeb4237a51745a5b312c916e57adc. 19 Sotheby, Wilkinson & Hodge, The Hamilton Palace Libraries. Catalogue of the Second Portion of the Beckford Library, Removed from Hamilton Palace (London: Dryden Press, 1882), https://hdl.handle.net/2027/umn.31951d00189727f?urlappend=%3Bseq=251, 22. 20 Henry Sotheran & Co., Sotheran’s Price Current of Literature, 11. 21 “About Us,” Sotheran’s of Sackville Street, accessed October 14, 2017, https://www.sotherans.co.uk/AboutUs.php. 22 C. T. Hagberg Wright and C. J. Purnell, Catalogue of the London Library, St. James Square, London, vol. 1 (London: The London Library, 1913), 521. 23 Victoria and Albert Museum, “National Art Library Collection of Armorial Bindings,” Victoria and Albert Museum, September 25, 2012, http://www.vam.ac.uk/content/articles/n/national-art-library-collection-of-armorial-bindings/. Created by Gabriel Lozano for Professor Brockey's HST 475, MSU, Fall 2017.